It has been a year since Toei's Failed Hero series Gohan Heishi became a hit in Japan. 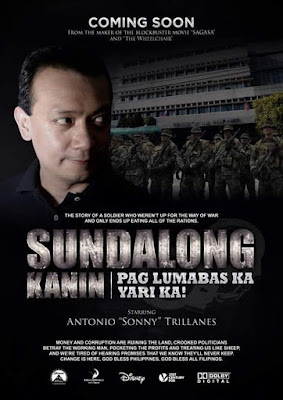 Now, with the pending arrest of Antonio F. Trillanes IV in real life -- Toei Ltd. now has announced its decision to make the movie they never made. The movie will be called "Gohan Heishi: Mirai no Heishi" or "Gohan Heishi: Soldier of the Future". This will be a spin-off, non-canon movie similar to the spin-off movies of Kamen Rider Ryuki: Alternate Ending, Kamen Rider Faiz: Paradise Lost and Kamen Rider Blade: Missing Ace. In this continuity -- the Shinjuku Mutiny succeeded in overthrowing Prime Minister Gloria Akeko from her seat. Worse, Gohan Heishi becomes the new prime minister and abolishes the Japanese Opposition and the symbolic monarchy -- making himself the sole ruler and dictator of Japan. He does this because of his superpowers and no one could oppose him. The plot involves a dystopian Japan where real Tokusatsu heroes are banned. Those who are going to star in the film will have the Kyurangers, Gavan II, Shaider II, Jiraiya, Janperson and the cast of Kamen Rider Build as the heroes. In this continuity, Tsurugi Ootori will seek to restore the Japanese Parliament with the help of the heroes. It is up to the heroes to finally expose the evil of Gohan Heishi's governance and why outlawing Tokusatsu heroes is a bad idea. Toei Ltd. has now assigned writer Nobohiru Mori as the screenwriter, Koichi Sakamoto as the action director and Jun Hikasa as the temporary producer. However rumors say that Hikasa may replace Shinichiro Shirakura as Kamen Rider Zi-O's producer. Shirakura is also currently assigned as Squatterman's producer -- which may result in work overload.